Dunkin' Donuts has entered the potato arena recently with their new hash browns. Notably I couldn't find any photos online of their hash browns thus the corporate logo at the left, but there is a quick snippet of what they look like at their website. Now when I went off to the local Dunkin' Donuts to try their new hash browns it occurred to me that I had not been to one since I worked in cubical hell several years back when getting coffee and donuts for everyone is a survival tactic. When I got inside I remembered that, for DD, customer service is job one, ahem, hundred. I really have to wonder: are the words 'miserable, unintelligible and rude' job requirements for this company? The two men and one woman working the counter looked and spoke as if they would have rather lost a limb each than have to deal with anyone else in the store. I was first struck by the wonderful menu over the counter which was incomplete and out of order, and which the man who served me took great delight in correcting for me rudely. He also noted that "no one ever looks up there, they just order" or at least I think that's what he said. The menu however gave for a price the words "Remove and insert price" and then underneath it gave prices for a single, a half-dozen and a dozen. I get it now, but the word "donuts" which should have between Hash browns and the quantities was missing. But then again, "no one ever looks up there." The hash browns themselves come nine-count and are stuffed into a small cup, and I do mean stuffed, so hard that you end up getting mashed potatoes at the bottom rather than hash browns. The most amusing thing about this cup is the warning on it: Caution: Contents can be hot. Can be? That's really not as decisive as 'may be' is it? Let's hope today is a hot day, shall we? The hash browns themselves are pretty much the same mutant mini-hockey pucks you get at Burger King or Chick-Fil-A that make eating breakfast at those places so unappetizing at times. These do have an extra little kick though, nothing to write home about, probably some store brand version of Mrs. Dash, and certainly nothing to make these things more edible. They claim they are oven toasted, which is half-right. Yes, I watched my favorite customer service specialist at DD scrape them out of a jar and put them on a pan and into an oven for about sixty seconds. But before that, they were most certainly par-fried and probably deep-fried once more before being ready for that oven toasting. This was not a good potato experience. Stay away from these things unless you absolutely have to. Wrong! The DD hash browns are delicious! 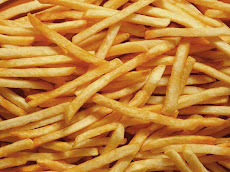 You are a failure and I hope every French fry you eat from this point forward is under cooked and needs salt! That's sweet. Thank you for your thoughts. I did try them again, six years after the original review: http://frenchfrydiary.blogspot.com/2014/01/french-fry-diary-552-dunkin-donuts-hash.html and found them to be much the same. Not my thing. I'm glad you like them. Enjoy.